In a touching tribute before Game 5 of the World Series, the San Francisco Giants had the three children of the late Robin Williams out to throw the first pitch. The video board played a tribute to the late actor and comedian, and then William’s son Zak, joined on the mound by his siblings Zelda and Cody, threw the pitch to Billy Crystal. Robin Williams tribute. His kids on the mound. Billy Crystal introducing a video, and Robin, from the beyond, firing up the crowd. Chills. The team showed this clip on the video board before the game as well. I decided to write a tribute to honor the request of Susan Schneider, Robin Williams’ wife, from a fan’s (my) perspective. Jumanji. Hook. Dead Poets Society. Popeye. Good Will Hunting. Aladdin. What Dreams May Come. What do these movies have in common? A great story? Sure. A happy ending? Of course. But these movies weren’t only amazing because of their screenplays. All had one amazing common denominator: Robin Williams. But, as is the case with all genuine artists, I think it is also true that the connection we feel to him through his performances is absolutely real. Whether he finds expression as a painter, writer, musician, dancer or actor — there are some aspects of an artist we can only really know through his work. Many fans first encountered Robin Williams on the TV show Mork & Mindy. That was also the case with me, but I don’t remember the show so well anymore. If ever it finds its way onto the rerun channels, I’d like to check out Williams’s lightning wit and spontaneous inventiveness in their first broad public reception. But I will never forget my first screening of “Dead Poets Society” which happily coincided with my first exhilarating weeks at university. In the film Williams plays a sympathetic, soulful and irreverent English teacher at a 1950s boys prep school. The film follows a group of seniors as they form a secret club to read aloud expansive and daring poetry in a forbidden, spooky nighttime cave. As they become inspired and emboldened by the camaraderie of their poetry society, the sparkling and evanescent words, and the antics of their fearless teacher, Williams, they begin, with mixed results, to learn the consequences of their exultant motto carpe diem. It is a movie with many themes — the tribulations of coming of age, the value of mentorship, class and societal expectations and restrictions, and the desires of the soul weighted against the imperative of earning a living. It also celebrates the transformative potential in art — in this case, poetry — and the power and meaning of inspiration. 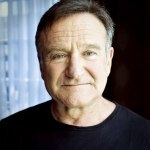 It was one of many movies, like “Patch Adams”, “Good Morning, Vietnam” and “Good Will Hunting”, where Williams plays a variation on a theme: an iconoclastic, funny, creative and deeply moral presence whose rare combination of spark and goodness influences the lives of others. The more we came to know Williams — not only through these performances but in his many appearances on talk or late night shows — the more it became clear that he was not simply handed a lot of great lines, but pulled many of them out of the air in virtuoso riffs that awed and dazzled even the most jaded, seen-it-all host. So inescapable was Williams’s unusual combo of improvisational gusto and sensitive perceptiveness that I think that it was impossible to completely strip either of these traits from his roles. He was not the kind of actor who disappeared completely into a part. Instead it was as though we saw Williams as he would be in another life as a dazzlingly fast-witted and compassionate doctor, teacher, shrink or wartime DJ. Williams rarely played a figure of authority but he was often a de facto moral leader — the light that shines in moments of darkness or doubt. He was the wise and laughing prophet who delivers sincere and believable pep talks, radical understanding and truth-telling, and, on the emotional side, compassion and a sense of wonderment in the crazy and strange miracle of life. When I saw the news of his death, which quickly turned to news of his suicide, various images of Williams in his many guises flashed through my mind. And I was saddened to think that they will all now be informed by his tragic end. But I also think it is important not to mistake the end for the whole story. It would be a disservice to his incredible life and artistry to allow his departure to overshadow his entire legacy. I have always been struck by the fact that you can know someone for years and years, and, in spite of your best efforts, never really jibe with them. On the other hand, it is possible to know a part of someone you have never met through a meaningful, almost magical, connection to their art. Someday soon I plan to see “Dead Poets Society” again. Some parts will undoubtedly be hard to watch, especially the last scene where the boys defy convention by staging a courageous, spontaneous tribute to Williams — their sad, and, in some ways defeated, departing leader — who is deeply heartened by this final, touching gesture of love and gratitude. It is indeed a heart-wrenching ending. But of a wonderful, unforgettable story. Now, we can understand why RW did what he did. He’s finished his final show. And we are left feeling woe. Williams had warmed our hearts. Was a mastery of the arts. ALADDIN… There were so many! Such a versatile actor he was! It’s like we’ve lost a friend. Their inner struggles, their strife. A life of laughter and bliss. We seldom see the abyss. What a tremendous loss to the world! One of the locals who came by to pay their respects was Agne Correll, the owner of an art gallery in nearby Mill Valley, which Williams had frequented. She brought flowers and her 7-year-old son — whom she said she wanted to teach the tradition of paying respects after someone from your community dies. “I didn’t know [Williams] personally, but I felt like I did. We all feel like we’ve been in his life,” she said of those who lived nearby in the area, which is north of San Francisco. When the curtain comes down…. That quote has been a favorite of mine for many years. It’s never felt more achingly true than tonight, as I sit here processing the death of Robin Williams. How painful and beautiful to read the spontaneous outpourings all over the internet tonight…fans, and friends, and thousands of ordinary people, expressing their admiration for his talent, their shock and sadness at his passing. I’m also reminded of words James Taylor sang twenty-years-ago, about the death of his friend, John Belushi. Depression is like trying to rappel up Niagra Falls. It is the boogeyman in the closet and under the beds that waits to surprise us when our guard is down and we thought we were safe. Antidepressants are the tools we have – but for some, the “zombie” effect – NO FEELINGS AT ALL – is like a living death…and at least the despair and despondency were real FEELINGS. Exhausting, but nonetheless real.It is the exhaustion that we succumb to. Because the human body and mind can only sustain levels of pain for so long before a complete shutdown occurs. The unrelenting anxiety of the unknown, the absolute dread of continued prolonged suffering without any ease causes the exhaustion which results in a meltdown…think of the Japenese Nuclear reactors. For some, the end result is insanity…a permanent visit to Neverland. For others it is a one-way ticket to Foreverland…a return “Home”. Submit Corrections DON MCLEAN Lyrics. Somehow, I just KNOW that this song is what Robin Williams heard in his head, when his depression took him over the edge. And forever away from all of us, who now shed tears of sorrow rather than tears of laughter. I will never again be able to hear this song without thinking of him. Shazbot and Bangarang, Robin.